Marc Sneyd lived up to his £100,000 transfer fee as Hull FC gatecrashed top 4 side Warrington Wolves with a comeback few would have believed possible to move into the coveted top 8 in Super League. Beaten by a drop goal when the Wolves visited the KC Stadium in February this time it was Hull’s turn to exact full revenge for that 6-7 defeat in dramatic style. Hull actually started the brighter of the two sides and took a deserved lead after 12 minutes as Jordan Thompson checked his run close to the Wolves line and forced his way over next to the posts, Sneyd added the goal to give the visitors a 6 point lead. The lead though didn’t last long as Warrington went down the other end and their captain Joel Monaghan latched onto a cross-field kick by young stand off Declan Patton to score, the conversion from Stefan Ratchford brought the score level at 6 all. The home side then hit the front as a flowing and fast move brought a try for Ben Currie, again Ratchford obliged with the conversion and inside 3 minutes they had gone from 6 points behind to lead 12-6. However, just as it looked like Tony Smith’s side were getting on top, Hull again wrestled back the initiative from their hosts and, after they moved the ball left then right, Setaimata Sa crashed over in the right corner, Sneyd missed the touchline conversion but Hull were back within two points. The game was being played at a furious pace and no quarter was being asked or given as some thundering tackles had fans of both sides almost wincing. With 30 minutes gone Hull again hit the front as more pressure on the Wolves line led to a deft little step by Sneyd and the Hull scrum half shot through the gap it created to score under the posts, he added the goal to his try and gave Hull a deserved 12-16 lead which they held until half time. Hull had looked more aggressive and adventurous with their attack in the first half and the question was could they keep it up in the second 40 minutes. The second half started, as the first had ended, at a frantic pace as both sides traded mistakes, possession and territory to each other. Monaghan pounced on one such mistake by Hull as they failed to deal with basic kick to the corner, the Wolves captain got the ball down just inside the touch-in-goal line to bring his team level, the missed conversion left the score at 16-16. Again Hull were guilty of laxity in defence a few minutes later and Gene Ormsby accepted the invitation into the opposite corner to put the home side 20-16 ahead, again Ratchford missed the kick at goal but, with less than quarter of an hour of the second half gone the Wolves had seemingly turned the match on its head. Hull were becoming dis-organised and the home side were taking full advantage as their famous attack was in full swing, another flowing move again pulled the visitor’s defence apart and, again, Ormsby found it too easy to cross in the left corner, a touchline conversion from Chris Bridge gave Warrington a 26-16 lead. On previous occasions, like last year and even in some earlier games this year, Hull would have caved in and let their hosts run rampant, but in recent weeks the Airlie Birds have shown great resolve to win games and that resolve was on full display again. The first chink of light was provided once again, like last week against Salford, by Mark Minichiello as he forced his way over in the 74th minute, the goal by Sneyd brought the score back to 26-22 and gave Hull genuine hope. Three minutes later and Sneyd raced through a gaping hole in the home sides defence inside his own half, having made the break he then passed to Tom Lineham and Hull’s top try scorer raced 40 meters, brushing off Ormsby, to crash over in the corner, the touchline conversion attempt from Sneyd missed and left the score at 26-26. Then, in the final act of this pulsating match after a stoppage for injury, Hull set up the final play 15 meters from the Wolves line, a quick exchange of passes and Sneyd hit a priceless drop goal with just 3 seconds left on the clock to win the game and send the Old Faithful into raptures. With their previously static attack now firing on all cylinders, and 5 wins in their last 6 games, Lee Radford’s side will now move on to their Challenge Cup 6th round tie at home to last year’s beaten finalists Castleford Tigers, next Saturday with fresh confidence and, perhaps most importantly, a winning mentality. Salford Red Devils 32 Hull FC 28 – Old Frailties Cost Airlie Birds Dear In Controversial Fashion! 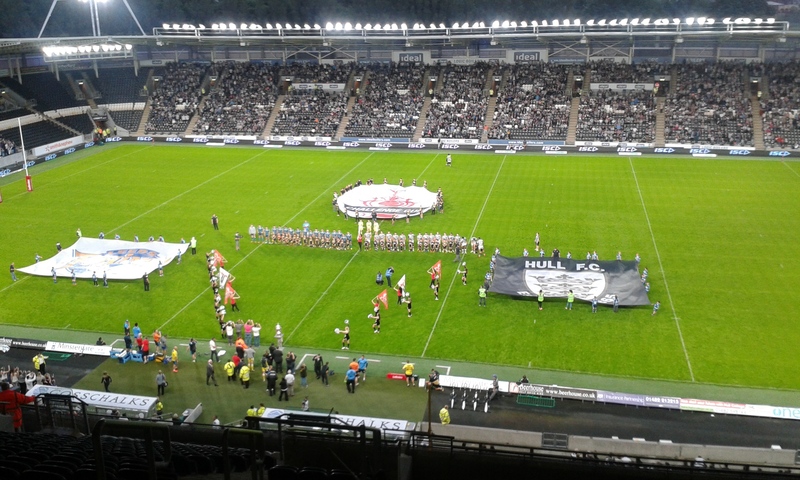 Hull FC slipped to a 2nd consecutive defeat on Saturday night in controversial style. The defensive resolve that was the hallmark of previous games against top 4 dwellers Huddersfield Giants and Warrington Wolves was suddenly, worryingly, absent. Led around the park by the mercurial Rangi Chase the Red Devils took full advantage of the defensive lapses to secure their first win of the season. The one positive Hull could take from the game was that their attack finally sparked into life as they scored some truly breathtaking tries, unfortunately they didn’t control Chase and the ex England player used his full bag of tricks to cut Hull’s paper thin defence apart. Early tries From Niall Evalds and Theo Fages established a 10-0 lead for the home side before Hull finally got going as new half back pairing Leon Pryce and Marc Sneyd linked to create a gap down the left which saw Jordan Rankin cross to score in the corner. Shortly after Evalds got his 2nd try after running a great line off Chase who fed him the ball to score, the conversion from Josh Griffin re-established Salford’s 10 point lead. Before half time Jordan Thompson gave Hull hope as he cut through the defence and raced 25 meters through some suspect tackling to score under the posts, Sneyd converted and after the half time hooter he added a penalty to leave the score 16-14 to Salford at the break. The second half started at a slower pace compared to the first as both sides looked for signs of weakness and it was Hull who took advantage first to take the lead as a grubber kick from Leon Pryce bounced up off a Salford leg into the grateful hands of Setaimata Sa to score. Sneyd missed the conversion but having wrestled their way back into the game Hull threw away their 2 point lead as Chase produced a moment of magic by passing to himself and then, with a deft backhand pass, he opened the gap for Josh Griffin to score. A few minutes later and Chase again opened up the Hull defence to put Griffin over again, although this time it seemed to be with more than a hint of a forward pass which referee Tim Roby failed to see. With Griffin adding the extras to both his tries Salford once again held a 10 point lead at 28-18. Once again the Hull attack sparked into life as a flowing move across the middle of the pitch led to a delicious pass from Sneyd to Put Jordan Thompson through for a breathtaking 2nd try under the posts. With the game moving at breakneck speed again referee Tim Roby had clearly lost control of all aspects, especially the ruck. Salford again raided the Hull line and Chase again opened the defence, this time with a blatantly forward pass, which again went unseen, to put Junior Sa’u in for the decisive try. Shortly after that injustice Tom Lineham crashed in at the corner but, controversially, referee Roby ruled out the score for no apparent reason. However Lineham would not be denied the next time he got over the Salford line moments later as he scored a carbon copy of the try that had just been disallowed, this time Roby awarded the try, Sneyd missed the conversion.